It has been just over two years since India suffered a mini balance of payments crisis in the summer of 2013. Since memory spans are short in the age of Twitter, it may be useful to recall that India’s external finances came under severe pressure in May that year when the US Federal Reserve announced its intention to phase down the second round of “quantitative easing”. That announcement precipitated an outflow of capital, especially foreign portfolio investment, which lasted throughout the summer. 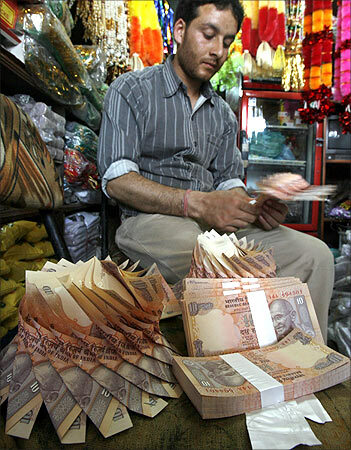 Despite heavy dollar sales by the Reserve Bank of India and an unprecedented 300-basis point hike in short-term interest rates in July 2013, the rupee vs dollar rate of exchange plummeted to nearly 70 by the end of August. Stability in currency markets was only restored from September onwards, as previously enacted gold import control measures began to take effect, substantial short-term, commercial bank borrowing was mobilised through a special swap scheme for dollar-linked foreign currency deposits and the US Federal Reserve modulated its May announcement in mid-September. Actually, the BoP crisis had been in the making for several years. 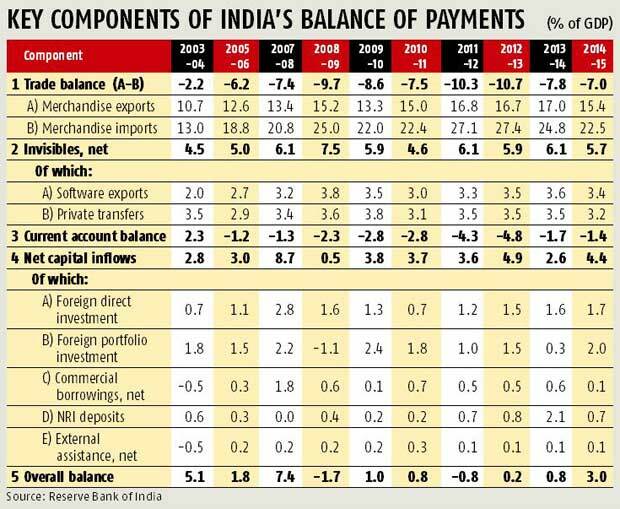 The current account deficit in the external payments had been running above the “danger level” of 2-2.5 per cent of gross domestic product since 2009-10, attaining record highs of 4.3 and 4.8 per cent of GDP in 2011-12 and 2012-13, respectively (see table). There had been no lack of external warnings (for example, “Roosting Chickens, Building Crises”, Business Standard, January 12, 2012, and “BoP: Zero Dark Thirteen”, March 14, 2013), with the usual limited effects. All that the “taper tantrum” of May 2013 did was to nudge a fragile external finance situation into crisis mode. A glance at the table suggests that the crisis management measures undertaken by the government and the Reserve bank of India worked quite effectively. The CAD declined swiftly from its peak of 4.8 per cent of GDP in 2012-13 to 1.7 per cent in 2013-14 and further to 1.4 per cent in 2014-15. In the current financial year, 2015-16, it could even reduce a little further. Thanks to the steep, policy-driven reduction in gold imports and the successful mobilisation of sizeable foreign currency deposits under the special swap scheme, the overall balance in external payments stayed positive in 2013-14 and actually improved a little. So, is everything now hunky-dory and are senior government spokespersons fully justified in touting India’s “strong fundamentals”, relative to other major emerging nations, in terms of economic growth, strong external finances and currency stability and continued progress with fiscal consolidation? Well, perhaps we need to look at the data a little more closely and think a little harder. First, the table shows that the entire downward adjustment in CAD between 2012-13 and 2014-15 is attributable to import compression of almost five per cent of GDP, from 27.4 per cent of GDP in 2012-13 to 22.5 per cent in 2014-15, mostly due to gold import restrictions (implementation of the so-called “20-80 scheme” and the suspension of the gold loan facility in 2013), the slowdown in GDP growth and, since summer 2014, the collapse in oil and other commodity prices. What is striking is that NONE of the CAD adjustment is attributable to an improvement in the exports/GDP ratio. Indeed, that ratio fell from 16.7 per cent of GDP in 2012-13 to 15.4 per cent in 2014-15. On current, distressing trends, it is expected to decline further in 2015-16, as trade data for April-August 2015 show a decline in export dollar earnings of 16 per cent. This is in sharp contrast with the export trajectory recorded after the full-fledged BoP crisis of 1991-92. At that time annual export growth had recovered quickly to exceed 20 per cent in dollar terms by 1993-94, two years after the crisis, and kept on growing at close to that rate for another two years. Third, in the last two years, there has been no improvement in the ratio of “net invisibles” to GDP. It has in fact declined a little from 5.9 per cent of GDP in 2012-13 to 5.7 per cent in 2014-15 and is substantially below the peak of 7.5 per cent attained in 2008-9. As ratios to GDP, the key invisibles categories of software exports and private remittances from abroad have stagnated or declined marginally. Remittances may drop further if international oil prices stay subdued. Fourth, with the impressive reduction of CAD being solely due to import compression, its future sustainability remains subject to the vagaries of international oil and other commodity (including gold) prices and the import intensity of any long-sought revival of industrial growth. The basic lesson is that the pattern of current account adjustment observed in the past two years provides limited comfort for the medium-term sustainability of our external finances. This concern is strengthened by the recent volatility of capital flows (especially portfolio flows), the fact that our external debt (which has grown by $70 billion in the last two years) has a 40 per cent short-term component (residual maturity) and the very strong likelihood of a rise in US policy interest rates in the next 9-12 months. No, I am not predicting imminent recurrence of serious BoP stress. However, I do think that the current level of complacency regarding our macro-balances is unjustified. If we are serious about medium-term BoP sustainability, we need to focus on the usual policy priorities of: continued fiscal consolidation; acceleration of productivity-enhancing reforms, especially as they relate to industry and infrastructure; unblocking the backlog of stalled projects; maintenance of a competitive exchange rate; rapid improvement in the ease of doing business; and a prudent policy approach to incurring greater external debt. To borrow from a different context: the price of external financial viability is eternal vigilance. Shankar Acharya is honorary professor, ICRIER; and former chief economic advisor to the Government of India. Views are personal.